Join two guys who have no experience running a marathon as they train to…well, run a marathon. With a little over 20 weeks, Steven and Anthony will learn all they can about running from surfing the web, believing suspect hearsay, and simply by trying something they’ve never tried before: running really really far distances no human should ever run. Each week they share how the training from the previous week went, some tips they’ve either discovered through experience or that they’ve gleaned off the internet, Songs to Run To, and any other topics that might come up along the way. This podcast might inspire you to stay in shape. Or challenge you to do something you’ve never done before. Or take up another twenty minutes of your morning commute. Whatever. Just enjoy it for what it is – two guys who need any motivation they can get to actually do something no one thinks they can do! The Gomers at last year's Half-Marathon. Anthony's updating his Facebook status. 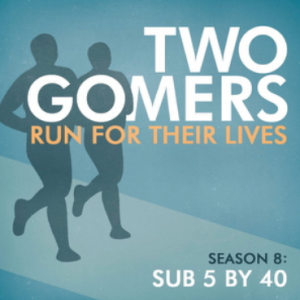 Just discovered your podcast… mmm… nice to find two equally gomeresque athletes!!! Love your podcast-its the first one I listen to when I turn on my i pod. It’s very inspirational and funny. Although I’m not a runner, I work out and am trying to lose weight. Thanks for the motivation and thanks for making it cool to like Full House–I don’t need to feel guilty about it anymore!! Good luck on the marathon; I look forward to hearing more about your adventures.-Middle aged mom and nurse. Love, love, love your podcast! Although I am one of those “fast” ones you refer to, I can still relate to everything you are going through. I had to go through it all too. I just finished my 7th marathon and thought it was going to be the lucky one. And it was. I have a great new PR of 3:31:28, but missed qualifying for Boston by a mere 29 SECONDS!! ugh. But, you two helped me get through the run and I thought you should know. When, oh gosh do I have to admit this, Christina Aguilara’s Fighter song came on, all 3 times, I cracked up. People look at you funny when you are running alone at mile 22 laughing for no reason. I am not sure you have been warned yet-I am only on #19-but when you get to 20 miles delirium can tend to set in. I am also a avid air drummer. It is the only arena in which my musical skills do not harm other people. My husband loved the “code brown” term as well since I had that at my first half and no one told me anything about it. Can you say clench?! I have another friend also listening to the podcasts and we are meeting in WI on May 1st to do a marathon together and can wait to discuss all the episodes. We frequently text-she is in Chicago and I am a MI Gomerista-about what episode we just finished but are careful not to spoil. lol. Please find another project once you complete your marathon. I feel like I know you and can not wait to get in the car, which is basically my office for the day, and pick up where I left off. and yes, the epiglotal thing can get a touch annoying but I am not leaving!